The sixth pick in the 2012 NBA Draft, Damian Lillard is hoping to help the Portland faithful take away the sting of Greg Oden, the team's last lottery pick. The high-scoring point guard hails from Weber State University. Lillard was the Big Sky Conference Player of the Year in both 2010 and 2012. 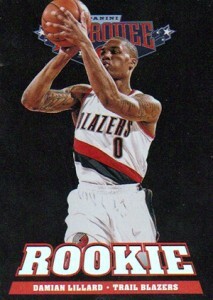 Following a fast start to his pro career, Damian Lillard rookie cards are seeing plenty of action. And after being named just the fourth unanimous Rookie of the Year, that demand likely won't be letting up any time soon. 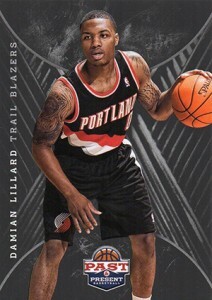 While many of Panini's first 2012-13 basketball sets are highlighted by autographed rookie cards, Lillard has less official options than most. 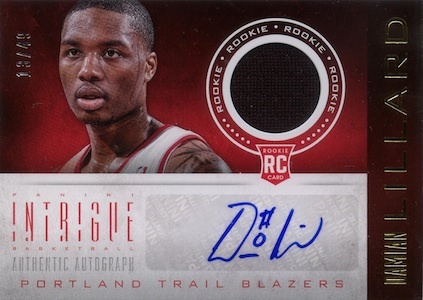 Although he has an exclusive multi-year autograph deal with Leaf, Panini made a deal with Leaf to include official Damian Lillard rookie autographs in several late-season products. 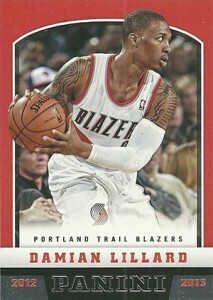 There will also be additional Damian Lillard autographs using the card designs from earlier 2012-13 Panini releases. 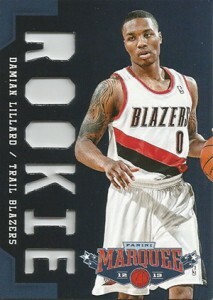 While this agreement allowed collectors a shot at official autograph rookie cards for Lillard, most are vey limited. 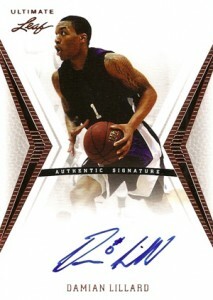 Leaf offers more obtainable autograph options in sets like 2012 Leaf Signature Series Basketball. However, they're not licensed so they can't be considered official NBA rookie cards. That isn't stopping them from fetching strong prices on the secondary market. 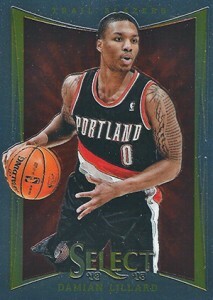 Slightly higher quality that NBA Hoops, the 2012-13 Panini Damian Lillard is a no-frills rookie card. It's highlighted by a clean design and an affordable price tag. 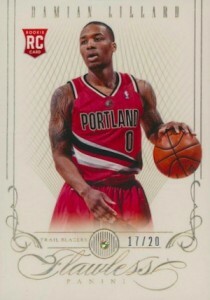 The heavy use of embossed foil makes this card stand out from Lillard's other rookies. The card is reasonably priced, largely because it's not a short print. "Look, Mom, Wings!" 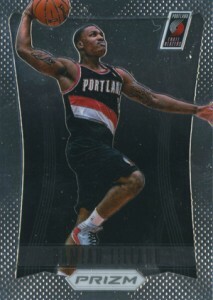 It's hard not to notice the silhouetted wings in the middle of the card that appear to be branching out from Lillard's back. Other than that, this rookie is very tame. The Crusade inserts seem to be getting a lot more of the attention. Without any autographed rookie cards coming for Damian Lillard, his top rookies are likely going to be the ones with the smaller print runs. 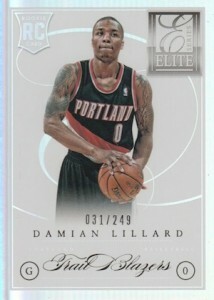 2012-13 Elite marks his first serial-numbered rookie card, limited to 599 copies. The clean look adds further appeal. It may not have the autograph or jersey piece that collectors generally seek in a rookie card, but Elite Series brings a high quality design and limited print run. 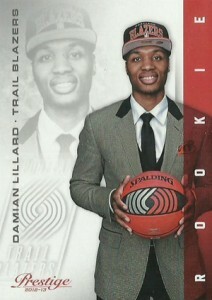 This makes for one of the best Damian Lillard base rookie cards available. Very few products allow collectors to a shot at cards with real diamonds in them. 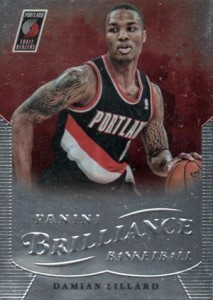 Only one, 2012-13 Flawless Basketball, produced a base set filled entirely with diamond embedded cards. 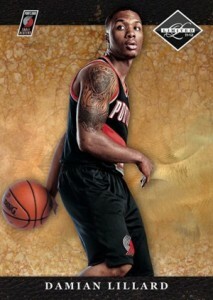 Now collectors with deep pockets can obtain a stud diamond along with a stud rookie card for Damian Lillard. Without any autographed rookies to look for, the best Damian Lillard rookies are likely going to be those with the lowest print runs. 2012-13 Panini Gold Standard vaults towards the top of the list. Numbered to 349, it also has a very high-end look to it. 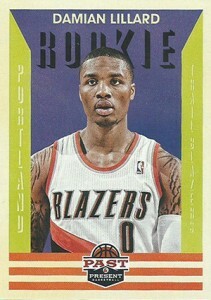 As far as flash goes, this is the top Damian Lillard rookie card. Featuring both an autograph and a patch swatch, it's in rare company. Also, numbered to 99, it also ranks as one of his rarest rookies. Flawless may have the bling and smaller print run, but Immaculate has a lot more while still be very rare. If there's one drawback, it's that the autograph is on a sticker instead of the card itself. 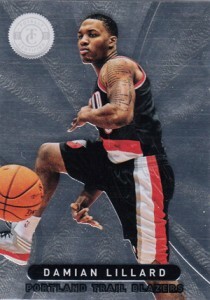 Although the base rookie is an acetate card, numebred to 349, collectors were more impressed by the first certified autograph for Damian Lillard in an NBA jersey. 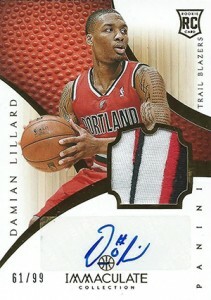 These Fine Print Autographs are the real draw of 2012-13 Panini Innovation Basketball. Although, because the autograph is an insert, it's not considered a true rookie card. 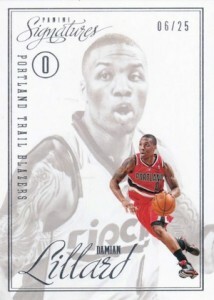 Likely due to his late inclusion as a signer for the product, Damian Lillard is the only rookie with both a base rookie card and a Rookie Autograph Memorabilia card. Although it has a sticker autograph, the limited print run of 49 and first card with a signature and jersey piece has made it a popular card. 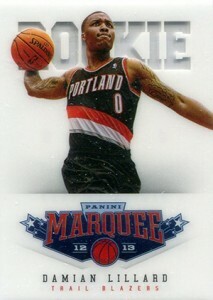 One of the key features in 2012-13 Panini Marquee Basketball are five different designs for rookie cards. Each of Lillard's rookies in the set look very distinct from one another. Card #151 has a wild foil look dubbed Swirlorama. The dark #231 is done with Black Holoboard. The third Lillard, #311, is highlighted by a laser cut "ROOKIE" notation. #391, the most valuable, is made of a faux leather. Finally, #461 is done with PETG, a type of plastic. 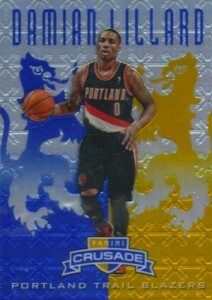 Like Crusade, the 2012-13 Panini Momentum Damian Lillard rookie is on the plain side. Something collectors may want to watch is the perceived rarity of this card. Momentum hasn't been among the hottest sets of the year meaning not a ton is showing up on the secondary market. Prices aren't very high, which could make this something of a sleeper. Generally, National Treasures is the top card for high-end collectors. 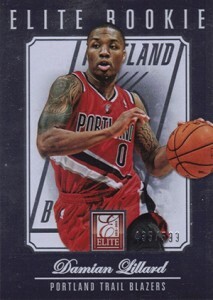 While this Damian Lillard rookie card still has strong value, the lack of autographs takes away some of the appeal for this popular product. 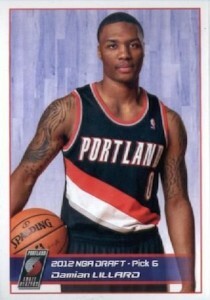 The 2012-13 NBA Hoops Damian Lillard rookie card has a definite throwback feel to it. The grey background, new hat and draft-day pose are reminiscent of the rookies found in some of the first Hoops sets from the early-90s. From an entry-level set, this card should always remain affordable. The 2012-13 Panini Past & Present base set goes more with the past. It has a retro feel, both in design and with its card stock. 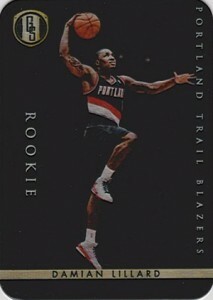 Lillard's rookie, like every card in the set, has a cool old-school feel. But it should remain one of his more affordable options. 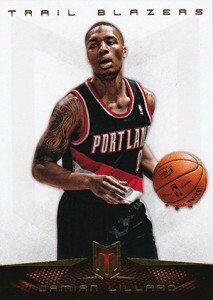 Another inexpensive choice, the 2012-13 Panini Prestige Damian Lillard uses the same photo as his Hoops rookie. However, the design emphasizes a lot more white space. Another base-level card, it's readily available and extremely affordable. 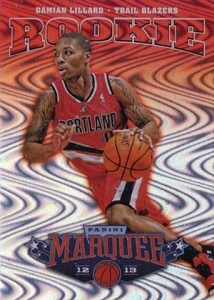 The 2012-13 Panini Prizm Damian Lillard rookie card could emerge as one of the favorites among collectors. Prizm is a new line from Panini, although it has a familiar feel. It's Panini's spin on Topps Chrome. The textured look and feel help set this line apart. Refractor-like Prizms parallels are also available. The Select name has been around for a while, just not so much recently and never on the basketball court. For its hoops debut, the Damian Lillard rookie takes a chromium look. 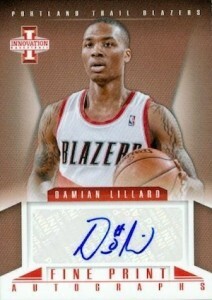 Because of Lillard's exclusive autograph deal with Leaf, he's the only rookie card in the set that isn't autographed. Following a non-traditional format, Panini Signatures includes Chase Rookie cards instead of normal base rookie cards. 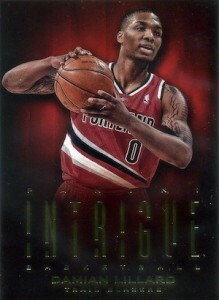 Damian Lillard has ten cards that each feature a different set of images. 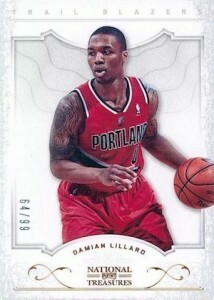 The cards are numbered to 25, totaling 250 cards for the Lillard set. Some may debate whether or not these constitute as true rookie cards because of the all-insert set structure. Not a traditional card, Panini Stickers is a great way to expose young collectors to the joy of cards. 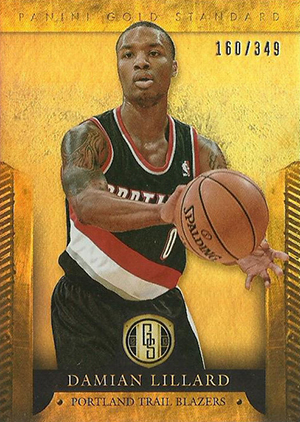 This Damian Lillard rookie card can be found for very cheap and there is also another card that honors his Rookie of the Year award. Loud and proud sums up the Totally Certified line. Since its inception in the late-90s, etched foil designs have been a main part of the base set. While the look isn't for everyone, it has a very passionate fan base, especially when it comes to low-numbered color parallels. 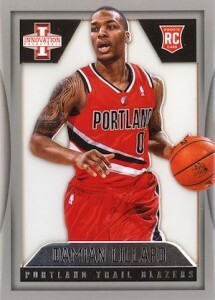 The 2012-13 Panini Totally Certified Damian Lillard is a solid mid-range option for collectors. 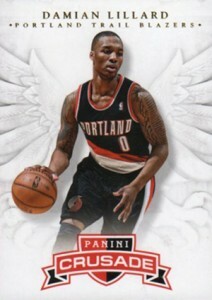 Panini inserted redemption cards for 2012 NBA Draft picks in their final three 2011-12 products. While no names are attached to the redemptions, themselves, these cards were determined by draft position. 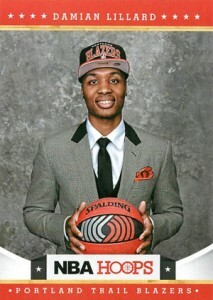 As the sixth pick, Lillard is card 6. 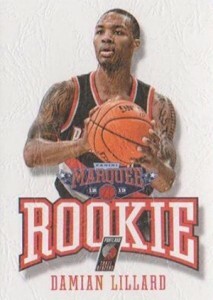 Although not official rookie cards, many collectors will still chase them due to their connection with the 2011-12 sets. Leaf made a big splash, signing Damian Lillard to an exclusive deal. While they allowed Panini a opportunity to include Lillard autographs of their own for a limited time, Leaf still retains that exclusive. Not surprisingly, Leaf featured him heavily in their products and will continue to do so.